Troubled by the fact that your furkid has been scratching all over their body? Or excessive chewing/licking of paws? Or in this horrible Singapore’s weather, the frequent hot spots your furkid is facing? Regardless if the trigger actually comes from allergies to food, environment, wrong usage of shampoos or genetic, do you know you can actually ease their itchiness and improve their skin & coat through Roots’ 3 Essentials? What is Roots’ 3 Essentials? 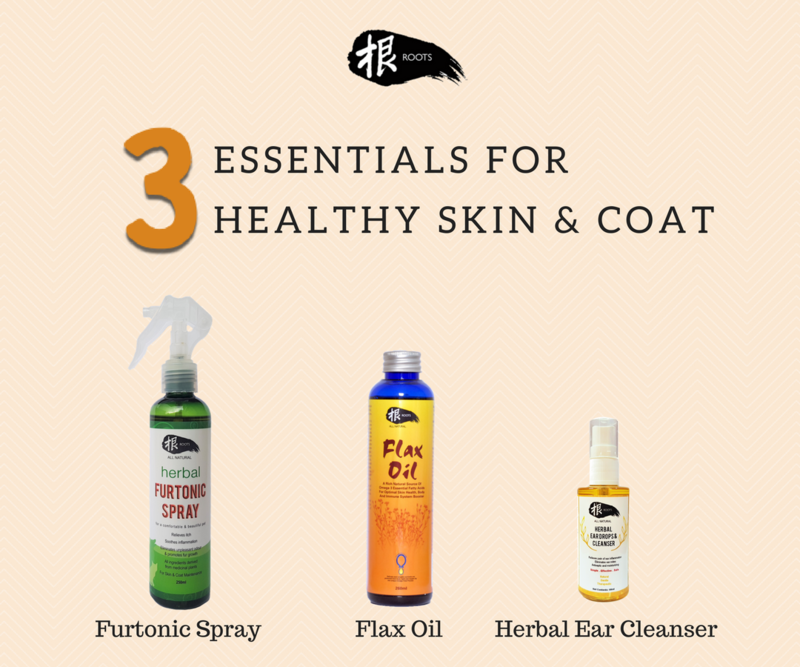 Roots’ 3 Essentials consist of Flax Oil, Furtonic Spray and Herbal Ear Drops & Cleanser. Each of these product is effective to be used on its own, but together it compliments each other for an even better improvement of your furkid’s skin & coat! How can Roots’ 3 Essentials help? Skin Allergies usually arises due to imbalance ratio of Omega-3 and Omega-6 in one’s body. Both fatty acids are critical to total body health, however too much Omega-6 can result in inflammation and skin allergies. In order to balance the ratio, pets will need to take in higher concentration of Omega-3. 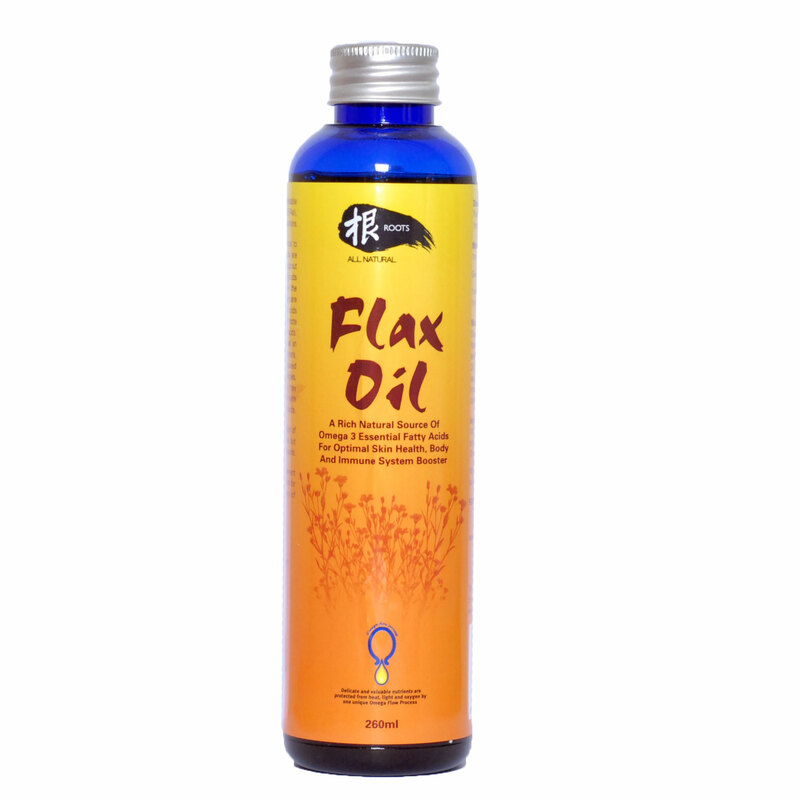 Roots Flax Oil has a higher concentration of Omega-3 fatty acids and a relatively low, but important concentration of Omega-6 fatty acids. 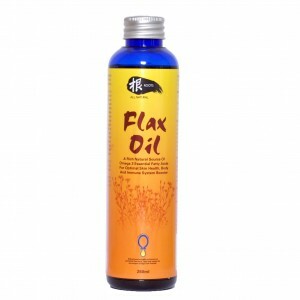 The advantage of Roots Flax Oil supplement is that it can be added to your pet’s food for overall health and for the treatment of illnesses without the use of drugs. Give mixed with food. Supplementation can be continued indefinitely but is more essential on a cooked diet and less necessary on a raw food diet. An alcohol base, all-natural herbal pet spray which consist of 7 types of herbs which helps to heal skin issues such as ECZEMA and is effective on all forms of rash, skin allergies, abscesses, fungal disorder, inflammation, minor cuts and scrapes. It helps to promote fur growth and facilitates healthy tissue granulation of skin with no excessive fibrosis. For pets who are facing irritation of skin cause by fleas and ticks, it will aid in reducing the urge to scratch, thus protecting the skin from getting worse. It is perfectly safe for both human and pets as all active ingredients are derived from medicinal plants. Yes you have seen it right, safe for humans too! Not convinced? Try it on yourself when you feel itch from mosquito bites! Shake well before use, spray as often as necessary! Made with a special blend of botanical infusions, cold pressed vegetable oils and essential oil, Roots Herbal Ear Drops & Cleansers is unique because of its oil-based instead of water-based to prevent water getting into the ears! 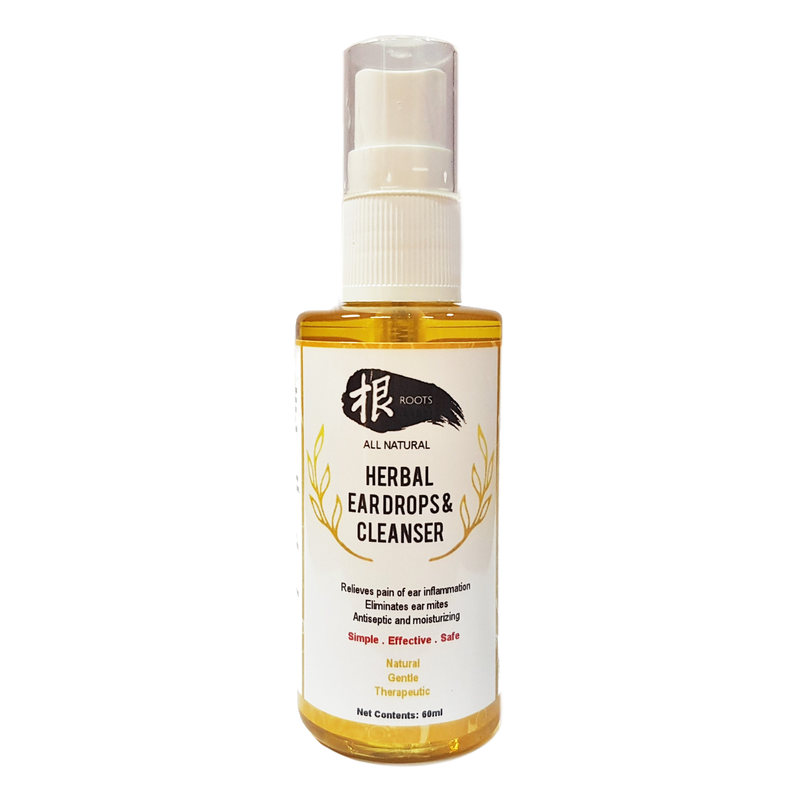 It contains mainly Jojoba oil, virgin Coconut oil, Peppermint and a proprietary herbal blend. Jojoba oil is used a room temperatures as an ear wax softener, an exceptional moisturizer. Virgin Coconut oil is excellent as a skin moisturizer and softener, reduces inflammation, and supports tissue healing and repair. Both oils applied topically and together with other oils and herbs help to form a physical barrier on the skin to ward off infection. Peppermint has antiseptic and decongestant qualities that can help relieve the pain of ear inflammation. An aid to the treatment of ceruminous otitis (excess wax in ears) and mild otitis externa (external ear canal infections), eliminates ear mites, and as an every day ear cleaner. Helpful for minor itch and may help ease irritation caused by seasonal allergies, and bug bites. Do you know, that you can even apply it on your furkid’s skin? Yes that’s right! 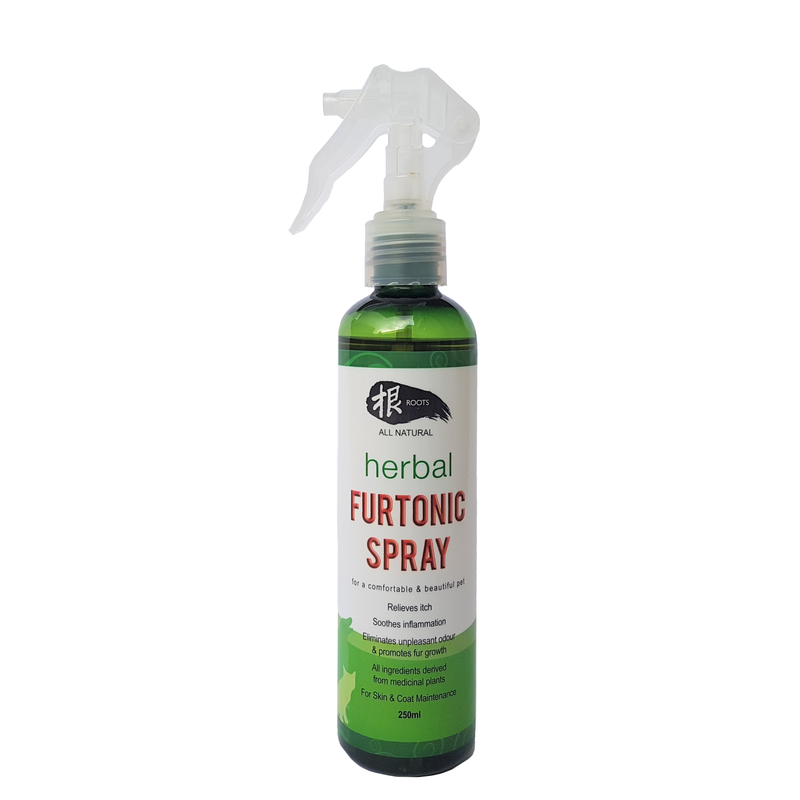 For flaky and irritated skin, after the usage of Furtonic Spray, apply Herbal Ear Drops & Cleanser for additional recovery due to the mixture of effective essential oil blends! Given that inner ears are actually skin as well, using our Herbal Ear Drops & Cleanser on your furkid’s skin is safe too! Visit here for a list of retailers that you can purchase your essentials from! Follow us on Instagram or Facebook for the latest perks and updates!